I have so much today now that we are home and rested a hardly have the time to stop and write this post. I’ve just ran around to the house of a lovely lady from Auckland Freecycle who has given me several bags of Romany fleece (white and black). My Ashford Book of Spinning tells me that Romney is a great fleece for beginners to spin, which would be me. If you don’t know about the Freecycle network you should seriously research it for your area. It’s a great resource for those 3 R’s. Among our clothing and christmas gifts I also managed to bring back my spinning wheel and spent a lovely time (except for the bit when I was swearing at the stupid screw thinging that wouldn’t go back into the hole it had come out of and had to grumble until Craig came and fixed it for me – love husbands *grin*). 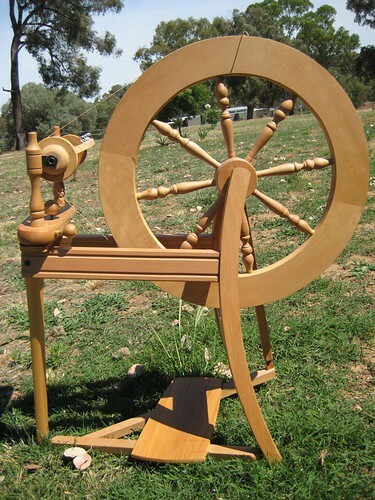 Anyway, I mostly happily put my spinning wheel back together, which gave me a much better understanding of how it all works, oiled up all the oiling up parts and now have a lot of reading and practice to do. Aside form the crafty things today, I’ve also been in kitchen whipping up a batch of Kombucha Tea (or Manchurian Tea, whichever you prefer). This tea is apparently renowned for all sorts of health wonders, it’s a fermented iced tea, basically, and I tried some and liked it so am now the proud owner of my own “Kombucha mushroom” (which is the started, somewhat like you would do for yogurt or sourdough). Once I finish writting this I will FINALLY get around to having a go at making my sourdough starter. Woodworking wise, Craig and I purchased a bed on TradeMe.co.nz, only to get it how and find it was WAY too short so we drove al the way back to the North Shore (North East of us) to give it back (long story) and thus we have decided to make our own bed again, so this Saturday is early morning farmers market shopping followed by bed making in the workshed, should be fun. Add a handful of flat beans cut into 2cm lengths and cook to taste (we like our beans to still have some crunch). Serve on a bed of lettuce (next time we would add some light items like cucumber to the lettuce and perhaps also serve with some asparagus). Delicious!